Currently, vulnerable and poor farmers and agricultural producers in all provinces of Cambodia face a lot of challenges, constraints, and problems related to climate change. Ongoing research and development in agriculture in Cambodia will play an important role in increasing food production to help support people’s livelihoods. Mr Samouth Chin is Deputy Program Manager in the Department of Agricultural Extension of the Ministry of Agriculture, Forestry and Fisheries in Phnom Penh, Cambodia. Mr Chin recently participated in a training program, conducted in the Riverland region of South Australia, which focussed on improved irrigation management techniques through enhancing on-farm participation approaches. Mr Samouth Chin (front row, right) visits the dryland farm of Mr Paul Rudiger (standing far right) at Loxton, along with other participants from Nepal, Bangladesh and India. 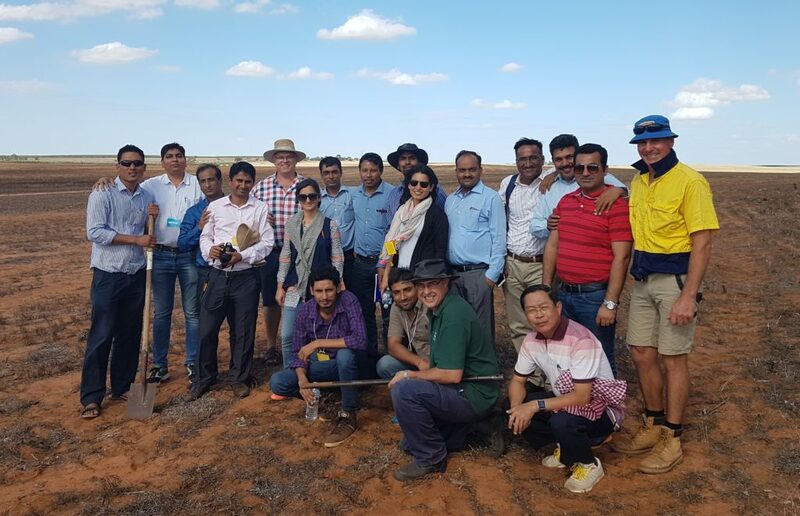 Hosted by International Agriculture for Development, the two-week program provided him with insights into how Australian farmers and authorities were managing scarce water resources in highly productive environments. While there are vast differences between the two countries, especially in terms of farm size and production systems, there are a range of ‘take home messages’ that, according to Mr Chin, offer enormous potential to Cambodian smallholder farmers. “Learning methods for managing water resources will provide huge benefits to food production in Cambodia, and the agricultural research and development in this area is likely to have a lasting impact for Cambodian agriculture,” said Mr Chin. “There are a number of simple low cost tools that can also be adopted by Cambodian farmers to improve the management of scarce water resources. These include soil moisture monitoring tools, understanding the physical subsoil constraints, and importantly, encouraging farmers to work together through ‘farmer-to-farmer’ participatory extension approaches,” he said. According to Chin, the lessons learnt from the Australian program included the fact that Australian farmers are always on the look out for new markets—they do the local market research before they choose what crops to grow. Mr Samouth looks forward to sharing his Australian experiences and renewed enthusiasm with fellow Cambodian colleagues who are involved in the Cambodian Ministry of Agriculture, Forestry and Fisheries’ new extension program initiative ASPIRE (Agricultural Services Program Innovation Resilience and Extension). “While Cambodian agricultural systems are faced with enormous challenges, the training program taught me to view these challenges as opportunities,” said Mr Chin.